NEW PRICE on this lovingly cared for sparkling clean home that is good as new, even better, with it's designer finishing touches like decorative window treatments, ceiling fans and lighting fixtures. 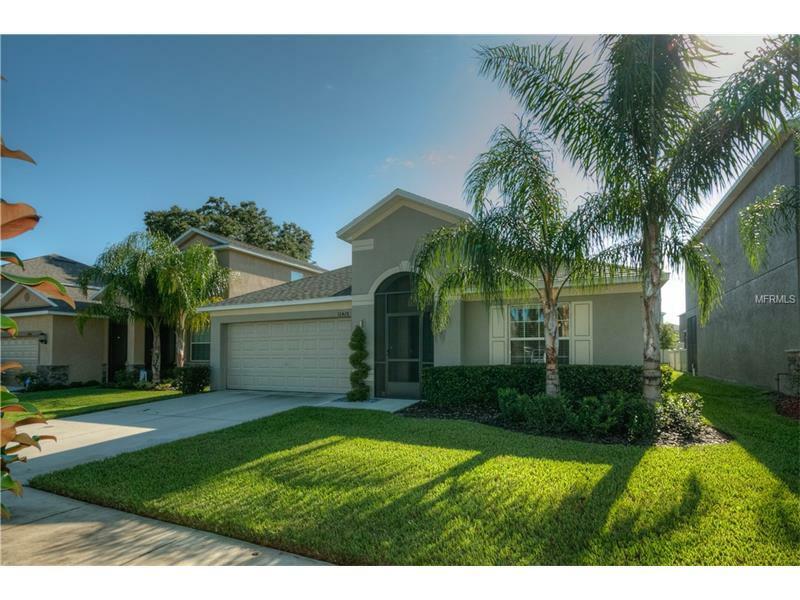 This move in ready home sits on a beautiful lot with views of the tranquil pond with fountain in the front, fantastic curb appeal with pristine landscaping and fruit bearing peach and lemon trees in the backyard. A well designed 3 bedroom 2 bath plus office home with a split and sun filtered open floor plan. Features include large neutral tile in all living areas, office and wet areas, kitchen with stainless appliances, granite counters, and plenty of 42' staggered cabinets with crown molding and roll out shelving, island with breakfast bar, screen enclosed front porch and screened, covered lanai in back that overlooks the spacious backyard, large master with en suite bath, dual sinks, granite tops, upgraded cabinets, garden tub and large walk in closet. The office is conveniently located at the back of the home next to the master suite and features double french doors and access to the lanai via sliding glass doors and can also be used as a 4th bedroom. All appliances convey including washer and dryer. 15 SEER HVAC, low E dual pane insulated windows and in wall pest control. Super energy efficient hot water heater that takes hot air out of garage while using that energy to heat water. Conveniently located in a quaint community with pool and easy access to interstate and amenities. Low HOA and No CDD fees! !